Like Torx screws, Torx bolts are becoming commonplace in a variety of assembly applications. Apex offers a wide variety of Torx sockets. Apex impact sockets have hex tolerances that are on average 48% tighter than DIN and 35% tighter than ANSI requirements. All Apex impact sockets have the tightest tolerances for straightness and concentricity in the industry. Apex impact sockets are specifically designed and manufactured for high impact use, and made from a tougher and more ductile alloy steel which is then heat treated for extra durability. The TX-1108 Apex E-8 Torx Socket, For External Screws, 1/4'' Square Drive is one of thousands of quality tooling products available from MRO Tools. Please browse Apex 1/4'' Square Drive Torx Sockets, For External Torx Screws for tools similar to the TX-1108 Apex E-8 Torx Socket, For External Screws, 1/4'' Square Drive. TX-1108 Apex E-8 Torx Socket, For External Screws, 1/4'' Square Drive description summary: Apex E-8 Torx socket, for external screws, 1/4'' square drive. 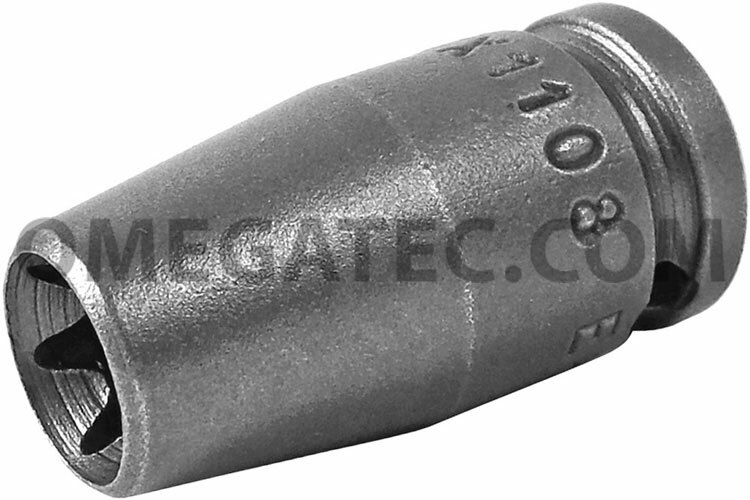 Driver Size: E-8 Overall Length: 1''/25.4mm Nose End Diameter: 3/8''/9.5mm Drive End Diameter: 1/2''/12.7mm Quantity discounts may be available for the TX-1108 Apex E-8 Torx Socket, For External Screws, 1/4'' Square Drive. Please contact MRO Tools for details.